Besides having enough water, your hiking footwear has the most radical impact on whether you reminisce about your hike in “Whoo Hoo!” or “*!%*!#*%!” terms. Having your feet feel impervious to the trail is pretty sweet. While getting bumped up toes, blisters or twisted ankles, due underperforming footwear, is less than cool! 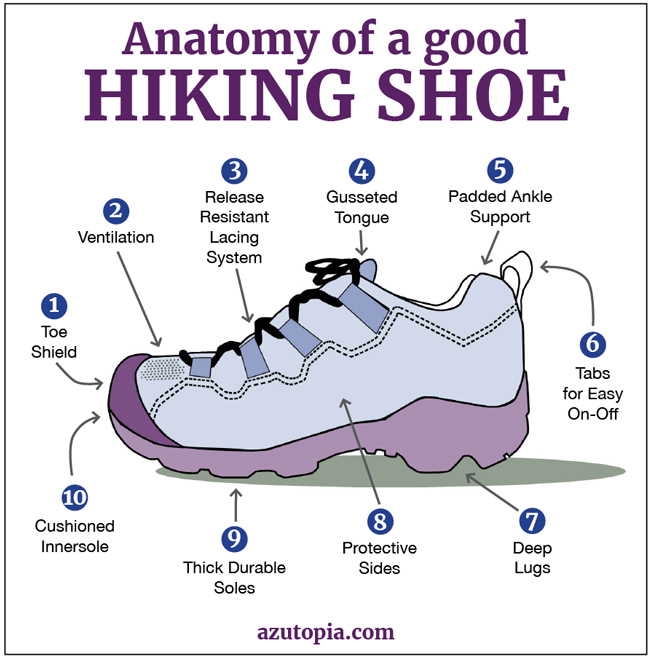 So what should you look for when choosing a hiking shoe or boot? 1. 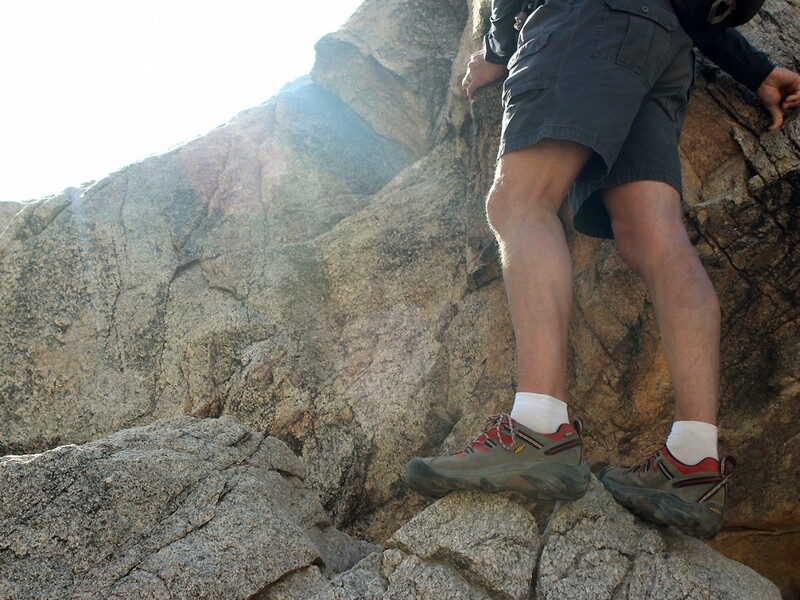 Toe Shield For hikes over rough or rocky terrain, a toe shield is an added bonus. It’s almost inevitable that your toes will bump into something harder than heck, and having extra protection keeps the piggies resting safe inside. 2. Ventilation A must in a hiking shoe or boot. Face it folks, we get sweaty! And damp shoes lead to chaffing and blisters. With today’s innovative fabrics and coatings, hiking shoes can be both waterproof and ventilated. Sweet! 3. Release Resistant Lacing System It’s super important that your laces hold your feet snuggly in place, and resist untying. Textured laces help hold knots together. While loops that hold laces firmly assure a good fit and help minimize interior foot movement. 4. Gusseted Tongue The sides of the tongue should be connected to the shoe with thin folds of fabric. Why? Because this keeps those annoying little rocks and debris from getting in! Plush padding on the tongue is another “Yes!,” as it relieves pressure from the snuggly tied laces mentioned above. 5. Padded Ankle Support Whether purchasing a below the ankle hiking shoe, or above the ankle hiking boot, your heel and ankle should be held snuggly and comfortably in place. This is the number one feature for minimizing twisted ankles and enhancing stability. 6. Tabs for Easy On-Off Although not a necessity, these little babies make getting ready to go a breeze. 7. Deep Lugs Look for a pattern of 4-5mm deep lugs (or protrusions) on the base of the sole, in durable rubber. Good lugs equal good traction – grabbing onto slick surfaces, or sinking into soft sand and mud for a lizard-like grip. 8. Protective Sides Similar to the toe shields above, double lined sides help ward of bumps and bruises from side impacts on the trail. 9. Thick Durable Soles Although a thick sole adds a little weight, it is the most important feature of a good hiking shoe or boot! Unless you’re only planning to hike on smooth surfaces, the soles of your feet will be bumping against a constant barrage of pointed rocks, uneven pebbles, etc. Without solid protection they will start to feel each poke pretty fast. Ouch! Look for dual density molded soles for the best performance. 10. Cushioned Innersole The lining inside the shoe or boot should feel solidly comfortable. Better quality innersoles hold their shape, and provide good arch support. Some are waterproof and breathable. Most innersoles can be easily removed to accommodate specialty orthotics if needed. 1. Fit The shoe or boot should feel snugly comfortable, but not tight. Toes should not touch the tip of the shoe (or they’ll get bruised during descents). If they touch, it’s OK to move up a size. When walking, the heel should stay firmly in place, and not slide up and down, or move forward and back. Make sure the laces are tied snuggly, and that you’re wearing your hiking socks, when testing the fit. 2. Your Hiking Level If you’re new to hiking, go for maximum ankle support, until those muscles build up. 3. The Type of Trails you Hike Hiking only on concrete? Then limit the shoe weight by going for a thinner sole and smaller lugs. Hitting rough and rugged trails? You’ll definitely want great traction (deep lugs) and protection (thick soles, toes and sides). If you’re climbing Mount Everest, you are in a totally different category! 4. Waterproofing If you’ll be hitting wet areas, hiking in weather or trudging through snow, look for shoes or boots with a breathable, waterproof coating. I was lucky enough to have an opportunity to test a number of hiking shoes, and was provided samples to do so. Of the many shoes tested, I really liked, and would highly recommend, the three listed below, for the reasons noted. If interested, you can click the links to view them at Amazon (Disclosure: If you purchase product through these links I will earn a very small commission which helps me to offset the costs of hosting the AZ Utopia website). KEEN Targhee II These shoes had excellent traction and all of the right protective features. Their wide toe box provides a broad, comfortable fit. Oboz Sawtooth Low BDry Very similar to the Keens. A little less toe protection. But with deep lugs all the way to the edges, for enhanced grip and stability. Northface Storm II Another shoe with excellent traction and stability. Less toe protection. But extra plush padding for lots of “Ahhh,” and a slightly narrower fit. I have been using Vasque boots for my last two pairs. Somewhat spendy, but deserve consideration on your list. I’ve had Vasques that I have really loved too. The ones noted are those that stood out from shoes I had the chance to test.